Mooresville Town Hall is located at 413 North Main Street, Mooresville, NC 28115; phone: 704-663-3800. Photo: Espy Watts Brawley House, ca. 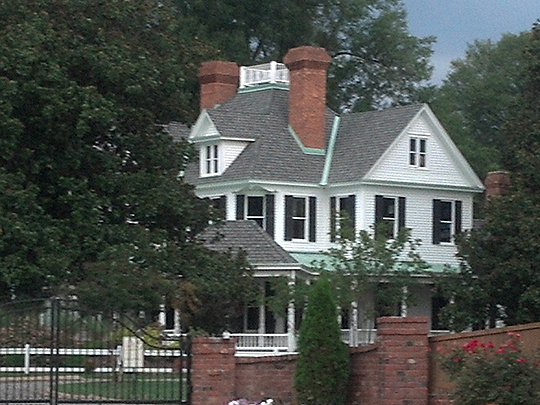 1904, 601 William Street, Mooresville, NC. Listed on the National Register of Historic Places in 1980. Photographed by User:Ncpappy (own work), 2012, [cc-by-3.0 (creativecommons.org/licenses/by/3.0)], via Wikimedia Commons, accessed January, 2014. Mooresville was founded as a direct result of the railroad. On August 18, 1856 the tracks of the Atlantic, Tennessee and Ohio Railroad were completed between Charlotte and Statesville. Because of the large shipments of cotton that were being produced in South Iredell County at the time, the railroad company decided to build a depot and side track somewhere in the area. Railroad promoters began a campaign in the area in order to be able to locate a site for the depot. Apparently realizing the commercial benefits that would likely follow the establishment of a depot, John Franklin Moore offered a site to the AT&O Railroad for the depot and also offered to sell lots to parties interested in building a town. His offer was accepted and because of it the railroad officials named the place Moore's Siding, a name used until the town was incorporated. During the midst of the Civil War in 1863, the community of Moore's Siding received a devastating blow when its life line, the railroad, was taken up to provide tracks for a railroad being built from Greensboro to Danville to help supply Lee's army with provisions. The rails were eventually returned and the railroad re-activated in 1872, enabling the town to continue its development. The history of the Town of Mooresville officially began on March 3, 1873, when the North Carolina Legislature passed a bill incorporating the town. The bill set forth that the town government should consist of a mayor and six commissioners. The AT&O depot was officially made the geographic center of town, with the corporate limits extending one mile in all directions from the depot. At first the town consisted of only two roads, the Public Road (now Main St.) running north and south and the Main Cross Street (now Center Ave.) running east and west. Laura A. W. Phillips, consultant for North Carolina Department of Archives and History, Survey and Planning Branch, Mooresville Historic District, Iredell County, N.C., nomination document, 1980, National Park Service, National Register of Historic Places, Washington, D.C.